The first 3 years of a child’s life are some of the most critical when it comes to brain development. For it’s during this period that the brains basic structure and design are shaped, which is greatly influenced by a child’s early experiences. Neurological pathways form when a baby is stimulated by things like colors, textures, smells and sounds. Therefore, providing the right toys can be an essential part of encouraging healthy brain growth. However, your role doesn’t end there! Babies and toddlers learn through play, so it’s your responsibility to guide them. From cognitive development, to hand-eye coordination, to developing fine motor skills, we recommend some of the top babies STEM toys in 2018. See our handpicked list of the best educational toys this year. Best for Developing: Fine Motor Skills, Sequencing. Recommended Age: 6 months – 2 years. Although it may appear simple, this multi-colored ring stack by Fisher Price is great for developing a whole host of skills. Firstly, babies have to experiment with trial and error in order to fit all the rings on the post. This also teaches cause and effect – if I put this sized ring on first, how does it affect putting the next rings on? Furthermore, handling the rings helps develop fine motor skills and hand eye coordination, as well as helping babies identify colors. Another skill it builds is sequencing, which is a key foundation in math. We chose this particular set because the top ring is also a colorful rattle, so can help stimulate your baby further. This timeless classic still made our list of STEM toys for babies in 2018. Best for Developing: Motor skills, Numbers, Cause & Effect. Recommended Age: 9 months – 3 years. The VTech sit-to-stand walker is a great STEM toy for babies taking their first steps. But what we really love about this particular model is that it’s full of sensory stimulation to keep your little one interested. Five numbered, light up piano keys play music, as well as animal noises to match the pictures on the keys. Additionally, it also features several spinning rollers, 3 shape sorters and various other light up buttons. 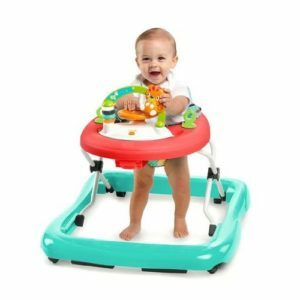 This colorful and engaging walker is a great way to develop both fine and gross motor skills in your baby. What’s more, the activity panel can be removed and used without the walker – great for portability! Best for Developing: Fine Motor Skills, Hand-Eye Coordination. Recommended Age: 6 months – 3 years. 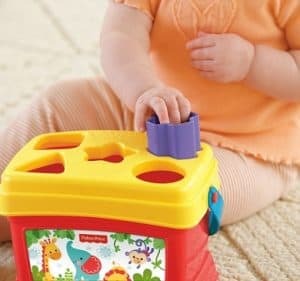 Similar to the ring stack, the Fisher Price Blocks are a great way for your baby to develop hand-eye coordination skills. The idea is simple, first you have to match the shapes of the blocks with the holes in the shape-sorting lid, then empty them out and try again! Repetition is what strengthens neural networks in a baby’s brain, so playing with this toy can help solidify important skills like identification and fine motor skills. Despite the simplicity, we think the ring stack is a great educational toy for babies to develop some basic skills. Best for Developing: Motor Skills, Sensory Perception. Recommended Age: 4 months +. If your baby is still a little young for the VTech walker, Bright Starts Walk-About Walker is a great alternative. This is a new take on the classic walker design, featuring a removable toy station to keep your little one stimulated. The station is complete with lights, music and sounds which respond to your baby pressing buttons and spinning the steering wheel. Don’t worry, the volume is adjustable! It also has an arc with slide-able parts. All these features are great for developing fine motor skills and learning cause & effect, whilst the walker itself can build gross motor skills. What we love about this particular walker is how it was built with both practicality and safety in mind. Firstly, it has 3 seat heights which can be adjusted as your baby grows. It’s also easy to fold flat for storage. What’s more, the walker has rubber feet designed to brake when it comes to an uneven surface such as steps. 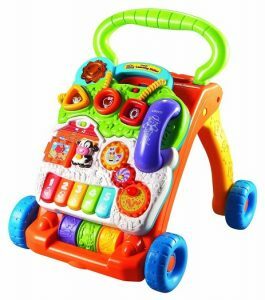 This all rounder is great value and is excellent learning toy for babies to develop lots of skills. Best for Developing: Fine Motors Skills, Words & Numbers. Recommended Age: 6 months +. VTech are another household name when it comes to educational toys for babies to learn STEM. 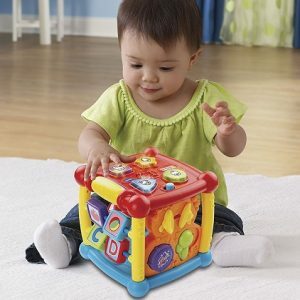 The VTech activity cube is likely one of their most popular because as it is affordable but full of features! Five sides of fun include spinning letters, light up buttons – which introduce shapes and animal names, 25 sing-along songs and 14 other interactive elements such as sliders and musical instruments. Furthermore, the cube is also sturdy and safe, with adjustable volume for when the songs get annoying! This is another great value option. You may have read through this list and thought, how are these STEM toys? Whilst you might not consider them strictly STEM, their purpose is to build the foundations of science, engineering, technology and maths skills. 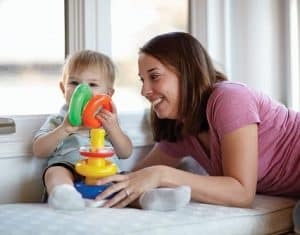 This can help give your baby a good grounding for when they do eventually grow old enough to use some of the other STEM toys you can find on this site. However, if you feel they are already too advanced for what’s here then check out our article on the STEM toys for toddlers.